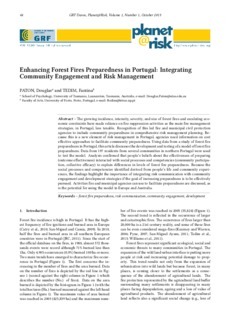 e growing incidence, intensity, severity, and size of forest fires and escalating economic constraints have made reliance on fire suppression activities as the main fire management strategies, in Portugal, less tenable. Recognition of this led fire and municipal civil protection agencies to include community preparedness in comprehensive risk management planning. Because this is a new element of risk management in Portugal, agencies need information on cost effective approaches to facilitate community preparedness. Using data from a study of forest fire preparedness in Portugal, this article discusses the development and testing of a model of forest fire preparedness. Data from 197 residents from several communities in northern Portugal were used to test the model. Analysis confirmed that people’s beliefs about the effectiveness of preparing (outcome effectiveness) interacted with social processes and competencies (community participation, collective efficacy) to explain differences in levels of forest fire preparedness. Because the social processes and competencies identified derived from people’s life and community experiences, the findings highlight the importance of integrating risk communication with community engagement and development strategies if the goal of increasing preparedness is to be effectively pursued. Activities fire and municipal agencies can use to facilitate preparedness are discussed, as is the potential for using the model in Europe and Australia.